Mold allergies are relatively common. A reaction occurs after inhaling tiny airborne spores or eating foods that contain mold. It can be difficult to avoid mold, since we’re all exposed to it in daily life. But you can reduce your risk of a reaction by checking all foods carefully for signs of mold and avoiding foods which are likely to contain it, such as cheese, mushrooms and pickles. Read all labels carefully and inform restaurant staff of your allergy. 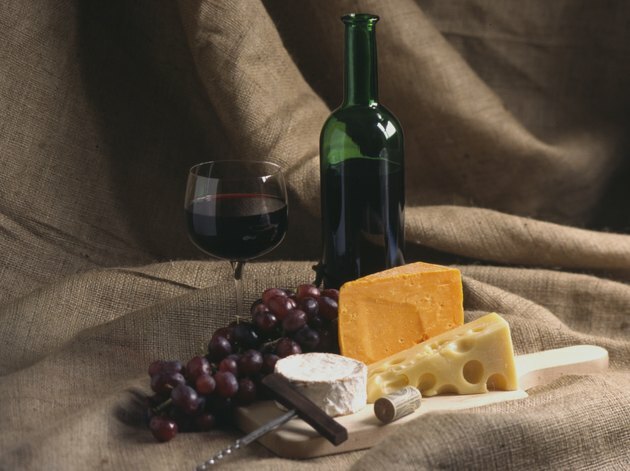 According to the Cleveland Clinic, common food sources of mold include cheese, mushrooms, vinegar, sour cream, sour milk, buttermilk, beer and wine. You should avoid sour breads, such as pumpernickel, and other breads and baked goods made with a lot of yeast. Sauerkraut, soy sauce, pickled and smoked meats and fish and dried fruit can also contain mold. Mold can grow in fresh or cooked meat and fresh or canned fruit and vegetables, if they're stored for too long. You can cut your risk of a reaction by carefully selecting foods you eat. Eat meat and fish when it is very fresh, and ideally don’t keep it for more than 24 hours. Choose fresh or frozen fruit instead of dried fruit. Make sure you store food carefully, and avoid eating leftovers. When buying canned fruit or juices, buy small sizes and consume them in one sitting, since mold often grows in sugary syrups. You don’t need to completely avoid yeast, but you might want to try yeast-free breads and products such as flatbreads and tortillas. Many store-bought salad dressings and condiments contain vinegar or cheese. A good alternative is making your own. Try substituting lemon or lime juice for vinegar in recipes, or drizzling olive oil on salads and vegetables. Although you should avoid cheese, yogurt can be eaten safely and is a good source of calcium. If you drink alcohol, distilled liquors such as vodka, gin and whiskey contain less mold than beer and wine, due to distillation and the high alcohol content. Try to keep your home as mold-free as possible. Clean refrigerator door gaskets and drip pans regularly to reduce the risk of mold growing. You should also dust regularly, clean humidifiers and try to avoid dampness in bathrooms, laundry rooms and basements. Wear a dust mask when mowing your lawn or sweeping up dead leaves. Avoid areas where mold tends to grow, such as wooded areas with heavy vegetation, especially in late summer. Your doctor can prescribe medications such as oral antihistamines and nasal corticosteroids to treat your symptoms. How Does Mold Affect Food?